Great writing about the current state of the country, plus a few picks from its past. School children in Revolution Square in Havana, Cuba. For a moment, he was obscured by the Havana night. It was as if he were invisible, as he had been before coming to Cuba, in the midst of revolution. Then a burst of floodlights illuminated him: William Alexander Morgan, the great Yankee comandante. He was standing, with his back against a bullet-pocked wall, in an empty moat surrounding La Cabaña—an eighteenth-century stone fortress, on a cliff overlooking Havana Harbor, that had been converted into a prison. Flecks of blood were drying on the patch of ground where Morgan’s friend had been shot, moments earlier. Morgan, who was thirty-two, blinked into the lights. He faced a firing squad. 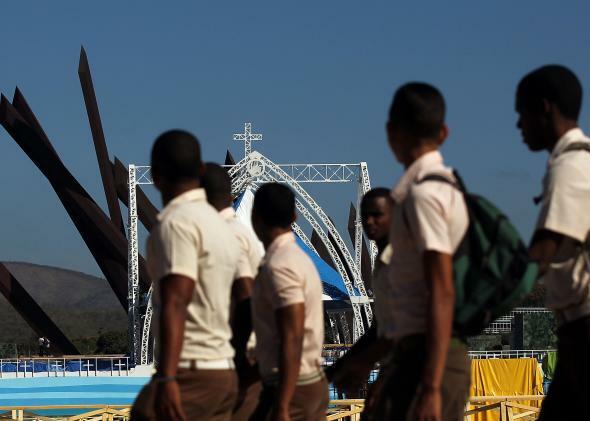 If there is in fact a Cuba under serious transformation—and you can find Cubans all over the country engaging now in their own versions of this same debate—Eduardo is a crucial component of it, although not for the reasons you might think. “Dissident” is the right label for a subset of politically vocal Cubans, notably the bloggers whose critical online missives have gained big followings outside the country, but Eduardo is no sort of dissident. He’s not fleeing persecution by the state. He’s just young, energetic, and frustrated, a description that applies to a great many of his countrymen. Ever since he was a teenager in high school, Eduardo told me, it had been evident to him that adulthood in revolutionary Cuba offered exactly nothing by way of personal advancement and material comfort to anybody except the peces gordos. The big fish. (Well, literally translated, the fat fish—the tap-on-the-shoulder parties.) Nothing works here, Eduardo would cry, pounding the steering wheel of whatever car he’d hustled on loan for the day: The economic model is broken, state employees survive on their tiny salaries only by stealing from the jobsite, the national news outlets are an embarrassment of self-censored boosterism, the government makes people crazy by circulating two national currencies at once. John Jeremiah Sullivan • New York Times Magazine • September 2012 The country’s uncertain future. On the plane, something odd but also vaguely magical-seeming happened: namely, nobody knew what time it was. Right before we landed, the flight attendant made an announcement, in English and Spanish, that although daylight saving time recently went into effect in the States, the island didn’t observe that custom. As a result, we had caught up—our time had passed into sync with Cuban time. You will not need to change your watches. Then, moments later, she came on again and apologized. She had been wrong, she said. The time in Cuba was different. She didn’t specify how many hours ahead. At that point, people around us looked at one another. How could the airline not know what time it is where we’re going? Another flight attendant, hurrying down the aisle, said loudly, “I just talked to some actual Cubans, in the back, and they say it’ll be the same time.” That settled it: we would be landing in ignorance. We knew our phones weren’t going to work because they were tied to a U.S. company that didn’t operate on the island. The young man’s friends could not be present, for it was impossible for them to show themselves in that crowd and that place with wisdom or without distress, and I like to think that, although Rodríguez could not know it, there was one person present when he died who felt keenly for him, and who was a sympathetic though unwilling spectator. In Cuba to tell the tale of a boxer, a filmmaker finds a larger story. Which worked, sort of. We had pulled into town knowing only vaguely where Bebin and Pedrin lived but were pointed toward a blue Chevy (painted with what appeared to be house paint) parked in front of a two-story block house. Bebin’s wife, Mena, answered the door. I’d forgotten about her natural enthusiasm: When I introduced my father and Tom, she shouted and fluttered her hand to her mouth, wide open, and touched her temples. She then led us toward the back, where Bebin kept his shop—a green, greasy bunker-like workspace packed with motors and car parts and buckets of oil. He stood shirtless, hairy and hunched over a workbench, attacking a fuel pump, and Mena demanded he turn around—look!—and he shuffled over like a Giacometti figure waking up, whittled by stress. And to the extent that I’d forgotten his wife’s flair, so, too, had I forgotten how understated Bebin was, so much so that I wasn’t quite sure if he was angry, or choked up, or what.